Paseo Juan Llinas s/n, 07560 Cala D´Or, Spanien. A three star hotel establisment with a total of 126 rooms found on the beach front, between the promenade and the comercial and leisure area of Cala Millor. This Hotel is perfect for those guests looking for a combination between relax and entertainment from this well known touristic zone. 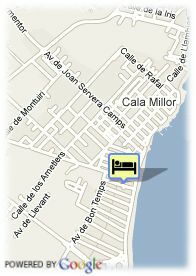 This Hotel can be found on the eastern coast of the Island.Possesing an unrivaled location with a view of the entire Bahia of Cala Millor, making it an ideal resort for unforgettable holidays. This Hotel, situated right in the middle of Cala Millor, offers 118 double-rooms and 8 individual-rooms all fully equipped with a telephone, satellite TV, double-glazed windows, ajustable air-conditioning, a furnished balcony, bath, etc.